Smart Security Systems For Your Home | Calgary Alarm Inc.
Smart security systems have made it possible to monitor your home from any location by simply connecting your alarm to a Wi-Fi network. Another benefit of smart security systems, aside from being able to monitor your home remotely, is that your home security system can be customized exactly to your needs. You can add a variety of additional features, from surveillance cameras or choose an alarm that can measure the air quality in your home. You can even create an entirely “smart home,” complete with door locks and garage door openers. Smart security systems also make it possible to have your home monitored by professionals on a 24/7 basis, perhaps one of the greatest benefits. They will contact the appropriate authorities in the event of a break and enter, flood or other emergency. If you are on the market for a smart security system, here are some things that you may want to take into consideration before you make your purchase. 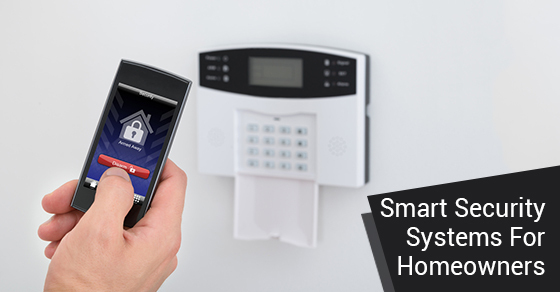 Do you want a wired or wireless smart security system? There are benefits to both systems. Do you want to install it yourself or have a professional do it for you? If you are looking for a smart security system, you will want to take the cameras, sensors and alarms into consideration. This will depend on the size of your home. Choose camera features that are based on your own needs. What kind of alerts do you prefer? Sound alerts or emails? This is a well-rounded smart security alarm—an all-in-one device. It’s high-quality camera can stream all of the activity in and around your home directly to the device of your choosing. It is also can be purchased in a 2-pack for those with a larger space to watch over. A key feature of this particular security alarm is that it also monitors the air quality, temperature and humidity in your home. It is also equipped with a built-in siren. This particular smart security alarm has the benefit of being able to monitor activity in rooms (and even other floors!) other than where it is placed. It’s key features include its intuitiveness, which reduces false alarms and automatically learns your personal routine. It is also i0S and Android compatible. This system is equipped with night vision and a powerful siren to alert you of any suspicious activity.